Wanted to get a 2 person tent for me and the son to explore. Money played a big part in the decision on this tent and I was not disappointed. 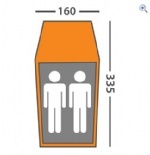 It comes with fibreglass poles and is secured with 7 hi-viz guylines. It pitches in less than 10 minutes and looks a very sturdy tent. Inside you have plenty of room for 2 and kit. 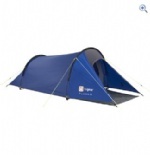 It's not the lightest tent but it is good value for money. So far it's kept us warm and dry in strong winds and rain. A good 2/3 season tent. Add your review of the Fusion 2! A 2 man tent for adventures and getaways.